Natural diamond is forged by tremendous pressures and temperatures deep underground. But synthetic diamond can be grown by nucleation, where tiny bits of diamond "seed" the growth of bigger diamond crystals. The same thing happens in clouds, where particles seed the growth of ice crystals that then melt into raindrops. "Nucleation growth is a core tenet of materials science, and there's a theory and a formula that describes how this happens in every textbook," says Nicholas Melosh, a professor at Stanford University and the Department of Energy's SLAC National Accelerator Laboratory who led the research. "It's how we describe going from one material phase to another, for example from liquid water to ice." But interestingly, he says, "despite the widespread use of this process everywhere, the theory behind it had never been tested experimentally, because observing how crystal growth starts from atomic-scale seeds is extremely difficult." In fact, scientists have known for a long time that the current theory often overestimates how much energy it takes to kick off the nucleation process, and by quite a bit. They've come up with potential ways to reconcile the theory with reality, but until now those ideas have been tested only at a relatively large scale, for instance with protein molecules, rather than at the atomic scale where nucleation begins. To see how it works at the smallest scale, Melosh and his team turned to diamondoids, the tiniest possible bits of diamond. The smallest ones contain just 10 carbon atoms. These specks are the focus of a DOE-funded program at SLAC and Stanford where naturally occurring diamondoids are isolated from petroleum fluids, sorted by size and shape and studied. Recent experiments suggest they could be used as Lego-like blocks for assembling nanowires or "molecular anvils" for triggering chemical reactions, among other things. The latest round of experiments was led by Stanford postdoctoral researcher Matthew Gebbie. He's interested in the chemistry of interfaces – places where one phase of matter encounters another, for instance the boundary between air and water. It turns out that interfaces are incredibly important in growing diamonds with a process called CVD, or chemical vapor deposition, that's widely used to make synthetic diamond for industry and jewelry. "What I'm excited about is understanding how size and shape and molecular structure influence the properties of materials that are important for emerging technologies," Gebbie says. "That includes nanoscale diamonds for use in sensors and in quantum computing. We need to make them reliably and with consistently high quality." Diamondoid seeds give scientists a much finer level of control over this process. Although they're too small to see directly, even with the most powerful microscopes, they can be precisely sorted according to the number of carbon atoms they contain and then chemically attached to the surface of a silicon wafer so they're pinned in place while being exposed to plasma. The crystals that grow around the seeds eventually get big enough to count under a microscope, and that's what the researchers did. "It was thought that this barrier must be like a gigantic mountain that the carbon atoms should not be able to cross – and, in fact, for decades there's been an open question of why we could even make diamonds in the first place," he says. "What we found was more like a mild hill." Gebbie adds, "This is really fundamental research, but at the end of the day, what we're really excited about and driving for is a predictable and reliable way to make diamond nanomaterials. 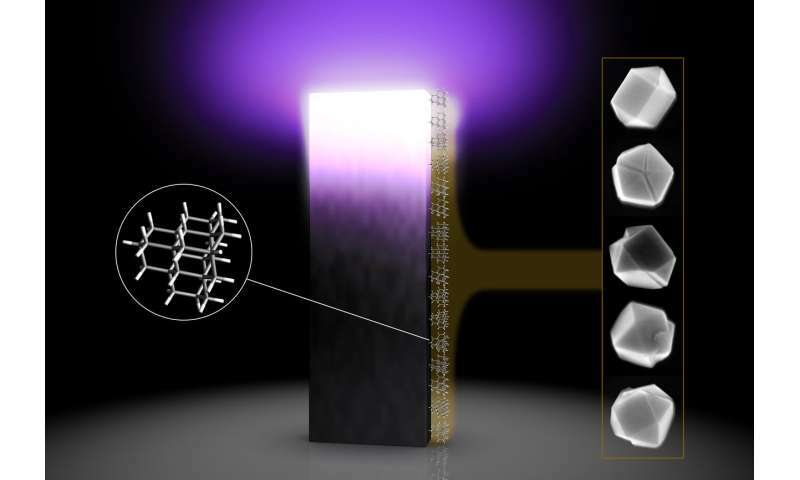 Now that we've developed the underlying scientific knowledge needed to do that, we'll be looking for ways to put these diamond nanomaterials to practical use."